Chicago, IL. 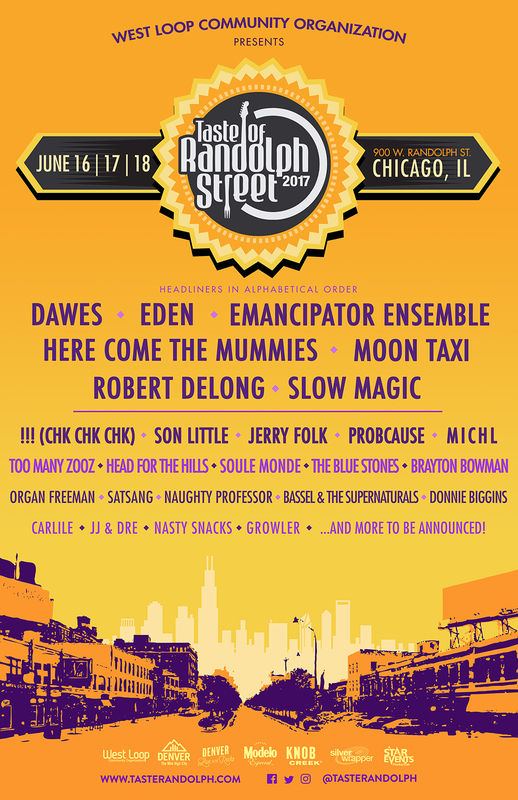 - The West Loop Community Organization, StarEvents, and Silver Wrapper have announced the Music and Restaurant Lineup for the 21st Annual Taste of Randolph Festival, taking place Friday June 16th through Sunday June 18th 2017. Upon its 21st year for this iconic street festival, StarEvents and Silver Wrapper have curated a list of the nation’s hottest and most revolutionary bands and musicians. Artists will perform on two stages and a DJ stage to entertain guests on their culinary adventure brought together by StarEvents and WLCO. It will feature the biggest and brightest names in Chicago dining, featuring over 18 restaurants exemplary for delectable menus and irresistibly unique flavors. Guests can enjoy Taste of Randolph in style with the TOR VIP ticket package which includes access to two VIP lounges, reserved viewing stands and lounge seating, private bathrooms, and beer discounts. Taste of Randolph benefits the West Loop Community Organization, which has been advocating for the West Loop neighborhood since 1991, supporting local businesses and economic development. This year, thanks in part to its popularity at last year’s Taste of Randolph, VISIT DENVER will return with its Denver Live on the Rocks Stage, featuring the jaw-dropping scale replica of Red Rocks Amphitheatre, Denver’s world-famous outdoor concert venue. Music lovers and musicians alike know Red Rocks as one of the best outdoor music venues in the world; it is recognized for its star-studded concert roster, natural acoustics and ambience, and it is widely considered a “bucket list” stage to play or see a show. The replica structure stands 76 feet long and up to 30 feet tall and features hand carved, hand painted exteriors to simulate the real Red Rocks monoliths; and this year, it will feature nightly headliners including Denver resident headliner, Robert Delong, and others- Dawes, Eden, Emancipator Ensemble, Here Come The Mummies, Moon Taxi and Slow Magic. By bringing Denver Live on the Rocks to Taste of Randolph, VISIT DENVER will showcase The Mile High City’s music, urban adventure and outdoor spirit to festival attendees. Denver, recently named the #1 place to live by US News & World Report, has quickly become a top vacation destination in its own right with chef-driven dining and a thriving cultural scene that includes major museums and charming neighborhood art districts. Denver also ranks as the best beer city in the country, as named recently by CNN.com, with more than 60 craft breweries in the city and more than 100 in the metro area. !!! 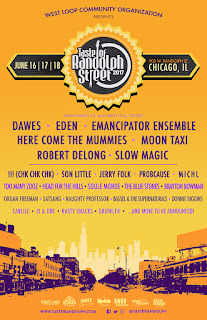 (Chk Chk Chk) | Son Little | Jerry Folk | ProbCause | Michl | Too Many Zooz | Head For The Hills | Soule Monde | The Blue Stones | Brayton Bowman | Organ Freeman | Satsang | Naughty Professor | Bassel & The Supernaturals | Donnie Biggins | Carlile | JJ & Dre | Nasty Snacks | Growler | and more to be announced! Alhambra Palace | Bar Siena | bellyQ | Chicken Shop | Cone Gourmet Ice Cream | Cruz Blanca | Formento’s | Forno Rosso | Grange Hall Burger Bar | Hello Tacos | La Sardine | MAD Social | Nando’s Peri Peri Chicken | Nicholas Quality Meats | Publican Quality Meats | and more to be announced! StarEvents: For 20 years Star Events has been producing produce select events that range from intimate corporate events to large scale music festivals. They have a stellar reputation in event consulting, planning, management and production, logistical support, talent buying, public relations, marketing, and conceptual processes, and help raise money and spread awareness for community groups and local nonprofits, bring audiences and talent together, and introduce people to the new favorite brands. Silver Wrapper: With over 15 years of producing and organizing club shows, concerts and festivals under their belt, Silver Wrapper has established themselves as Chicago's preeminent fan and artist first independent concert promoter. The Silver Wrapper team is grateful for the continued growth within their organization & live music community, and are proud to recognize “It's not a party without the people!”, over and over again. VISIT DENVER, The Convention & Visitors Bureau: Celebrating 108 years of promoting The Mile High City, VISIT DENVER is a nonprofit trade association that contracts with the City of Denver to market Denver as a convention and leisure destination, increasing economic development in the city, creating jobs and generating taxes. A record 16.4 million visitors stayed overnight in Denver in 2015, generating $5 billion in spending, while supporting nearly 55,000 jobs, making Tourism one of the largest industries in Denver. Learn more about Denver on the VISITDENVER website and at TOURISMPAYSDENVER or by phone at 800 2 Denver. Denver International Airport (DEN; flydenver.com) connects The Mile High City to more than 180 destinations worldwide including nonstop service to 18 international destinations in seven countries. Follow Denver’s social media channels for up-to-the-minute updates at: Facebook.com/visitdenver; Twitter.com/visitdenver; Instagram.com/visitdenver; and YouTube.com/visitdenver. History: For over two decades, Taste of Randolph Street Festival has provided some of Chicago’s best restaurants with an unparalleled opportunity to show of their greatest dishes to the city’s hungry masses. Location: 900 W. Randolph, Chicago IL.